Want to enjoy the iconic Central Harbour Front view and practice yoga for free? Join us at AIA Vitality Park to enjoy a unique workout experience with a skilled yoga master. 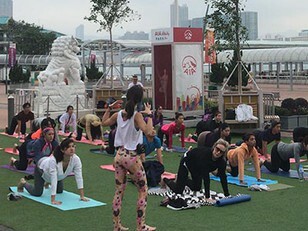 AIA Vitality Park at the Hong Kong Observation Wheel is a brand new wellness area at the iconic Central Harbour front which promotes fitness, exercise and a healthy living. The Yoga Room is a boutique yoga studio in the heart of Sheung Wan with four studios. The Yoga Room offers over 100 classes per week designed for the beginner to the advanced. The Yoga Room is proud to offer group classes in Hatha, Vinyasa, Hot Yoga, Hot Flow, Yin & Candlelight Yin, Yin Yang, Ashtanga, Yoga Therapy, Restorative Yoga, Warm Stretch, Gentle Flow, Detox Yoga, Yoga Nidra & Meditation, Mindfulness Yoga, Core, Inversions, Hammock Yoga, Wheel Yoga, Forrest Yoga, Zumba Dance, Pre-natal Yoga, Pre-natal Pilates, Mum & Baby Yoga, Kids Yoga, Mat Pilates and TRX, all taught by Certified instructors. With a focus on small classes and high-quality, personalized instructions, the teachers of The Yoga Room radiate with warmth and knowledge from their extensive and diverse trainings. The Yoga Room also offers many Yoga teacher trainings, workshops, retreats and outdoor events. "Health comes from the inside out." A concept that stands true to Astrid's love of Yoga. Initially, her studies in Clinical Counselling and Exercise Science treated mind and body as separate entities. Yoga spotlighted the bridge between the two, and brought her to treat patients with a holistic wellness approach. It was after a life of competitive Track & Field and Sports, that Astrid discovered Yoga in 2002. It was a new athletic venture that became a passion and lifestyle. She took her first Yoga Teacher training in 2011 and continued to improve mental and physical performance. She recently completed her 500-RYT that bridged TCM and Ayurveda within yoga, and is always seeking new ways to learn more about the ancient science of Yoga, Breathe and Meditation. Astrid is passionate to inspire others and empower them using her skills as a psychologist, and knowledge of the power of movement. She can be found outside of the studio exploring the outdoors hiking, swimming, and running. Fusing her scientific knowledge with ancient practices to create powerful holistic evidence-based classes and treatments Astrid teaches a wide array of yoga approaches. From a fiery core power class to a blissful YIN, you can find a class that suits your needs. She focuses on the importance of posture, alignment, and core integration for invigorating and healing classes. She loves to challenge, and wants students to find their power with ease. Her teachings hope to empower and inspire and help unleash your full potential spiritually, mentally, and physically. You are recommended to bring your own equipment such as yoga mat and yoga brick, towel and spare clothes. A limited number of yoga mats will be provided but there may not be enough to supply to all participants. Please keep warm and wear comfortable sportswear to enjoy the workshop.